About a week before I learned I was pregnant, I was diagnosed with Graves’ Disease, an autoimmune disease affecting the thyroid. It can cause miscarriages, but can also onset or remit during pregnancy, so I was closely monitored every 4 weeks with blood tests and thyroid function tests/ultrasounds. Thankfully, I had no symptoms so I did not require any treatment beyond regular monitoring. I had some morning sickness with Claire; nausea daily and some vomiting here and there. I used sea bands, ate lemon candies, but mostly I just powered through to eat when I could. I told very few people we were pregnant until 12 weeks given our previous experience (we had told everyone then at 6 weeks, and later had to tell everyone again that we’d lost the baby). I was showing by 9 weeks but could hide it, but I was in maternity clothes by 14 weeks. We declined the screens and genetic tests, and opted only for the ultrasounds. Because of the previous miscarriage, and Graves’ Disease, I got an ultrasound at almost every visit during my pregnancy with Claire, until about the third trimester. At 18 weeks, we learned our baby was a GIRL. We had no preference either way, but were ecstatic nonetheless. Unfortunately, our good news was laced with a caveat: there was a marker on her heart that needed further testing. They told us it could be an indicator for Down Syndrome, so they sent us to Maternal & Fetal Medicine at the hospital. We had an hour long in-depth anatomy scan where a doctor and sonographer took over 80 images of her. At one point they actually strapped my feet to the table and tilted it so that my feet were above my head to get her to move in order to get images of everything. Based on the results, the doctors determined that this marker for Down Syndrome was inconclusive. Apparently the majority of babies born with Down Syndrome have this on their ultrasound, but not every baby who has it on their ultrasound ends up being born with Down Syndrome. At that point, we decided to forgo any further testing. We believed that God had designed her exactly how He wanted her to be, and that meant Down Syndrome or not. We would not terminate the pregnancy either way, so we decided to wait until she was born to find out. We did not feel this diagnosis would be a curse anyway. At my 36 week check-up, I was 70% effaced, 0 cm dilated, and she was at -1 station. At 37 weeks I was 80% effaced, and ½ cm dilated (I later learned this was just a nice way of saying “you’re starting to dilate but really nothing is happening yet). At both my 38 and 39 week checkups, I was still 80% effaced and ½ cm dilated. She remained at -1 station. I began contracting a few hours later. They were mild, slightly more uncomfortable than Braxton-Hicks, but more regular: 10 mins apart. I took a 2 1/2 mile walk around my neighborhood with my sister who had flown in the night before, and my neighbor, to try and speed my contractions up. We went to Whole Foods for dinner and I distinctly remember having my first painful contraction right in the produce section where the avocados were. I had to squat to breathe through it. From then on, they were about 5 minutes apart consistently. That was about 5pm on Saturday. My contractions continued through dinner and intensified, and I felt too sick to eat. I called the on-call doctor at 8:45pm, who said to lie down for an hour to see if they subside. He said the first 30 min of lying down might be worse, and he was right! After lying down for an hour, my contractions were still consistently 5 mins apart, and I was not able to talk through them (I did, however, do a lot of yoga ohms). We left for the hospital at 10:30pm. Jason made coffee for he and my sister while I cried. It suddenly felt very real! We took two cars (Paige’s flight was scheduled the next day), and I contracted in the car. Holy Toledo, least favorite part of labor ever. Because it was after hours, we entered through ER, and I was taken to L&D triage with Jason. Paige had to wait out in the waiting room. An energetic nurse did my exam. I was 3cm dilated, but the baby was still at -1 station. She talked to on-call doctor who was willing to admit me but their suggestion for a natural labor was to go home and eat/drink/be comfortable and come back when I couldn’t take it anymore. I threw up in triage, and the doctor never came in to see me. By the time all was said and done we weren’t home again until ~1am. We decided to take one car knowing we’d be back. I threw up again in the garage. My contractions held steady at 5 minutes apart all night but got progressively stronger. Paige and Jason alternated sleeping and staying up with me so I wasn’t alone, which I appreciated so much at the time (but in hindsight, I wish I would’ve had them both rest). I tried to labor in the tub, but I was too big! I didn’t fit in my guest tub well enough to get comfortable. I fit in my Master bathroom tub but ran out of hot water before I was covered with enough warm water. Paige and Jason wouldn’t let me stay in long enough because they were afraid I was gonna fall asleep and drown in the tub! I threw up 2-3 more times throughout night. I tried to drink some fluids but I was unable to eat much. I had some diarrhea, too, which I took as a good sign (one of my fears was pooping during labor. #realtalk). Because I couldn’t fit in the tub easily, I ended up taking several hot showers. I found one of the best ways to manage pain during my contractions was singing or ohm-breathing. My favorites were “Lord I Need You” by Matt Maher and “How Deep the Father’s Love for Us” by Selah. Sunday morning we called the doctor at 8:45am. My contractions were still about 4-5 minutes apart, but I was definitely exhausted and having trouble managing the pain at home. Even though I wanted a natural drug-free labor, the triage nurse from the night before gave me that as a benchmark for when to come back: when you feel like you can’t manage the pain anymore. The on-call doctor happened to be my favorite OB from the practice! We took this as a good sign and woke Paige to head in. My Mom was out of town and when labor started on Saturday she grabbed the earliest flight she could, which ended up landing Sunday at 10:30am. We met her at patient registration at the hospital at 11am. In triage I was 5cm dilated. Paige and my Mom waited while Paige changed her flight so she wouldn’t miss the birth! My contractions were still 3-5min apart for several more hours. I was admitted to L&D around noon on Sunday. If you’re following, it’s been just about 24 hours from my first contraction. The drain in the bathroom in my hospital room didn’t work, so my hopes of a big tub with warm water were dashed. They let me shower, and they let me labor on a birthing ball. I was not hooked up to any IVs or electronic monitors, so I was free to move about the room. I felt most comfortable squatting on the ball. Around 5pm on Sunday, Dr. Byrd broke my water when I was dilated to 8cm. So much fluid! It continued to pour out. My fluid was mostly clear but there was some meconium-stained fluid at the initial rupture, so I was told delayed cord clamping and immediate skin-to-skin may not be possible. Dr. Byrd said the NICU team would be there for delivery to evaluate. If the baby was not born crying, she would have to go right to team to be evaluated for aspirating on meconium, but if she were already crying, I would be allowed to keep her on me for immediate and uninterrupted skin-to-skin and delayed cord clamping. I was offered a dose of fentanyl at 6pm when I was still only(!) at 9cm. I had no break between contractions for the last 2 hours at that point, and I’d been in active labor with no rest for almost 30 hours, so I took it! It only lasted 45 minutes, but I felt like it helped me regain some strength. I was too afraid of it to get more (I’d read about temperature regulation in infants, constipation in mothers, and a bunch of other stuff I didn’t know much about to feel comfortable getting another dose). Thus far, the most painful part of labor was at 9 ¾ cm when the nurse tried to move the remaining part of my cervix over the baby’s head! I remember yelling “WHAT ARE YOU DOING? !” Other than riding in the car in the throes of active labor, my other least favorite part is laying on my back for an invasive vaginal exam while I’m contracting. Seriously, it’s so unnatural and SO uncomfortable. I probably got an exam every hour despite being hooked up to the fetal doppler, and I wish I’d have declined half of those exams! At around 7:45pm the nurse said “ok, 10cm!” I had no urge to push. 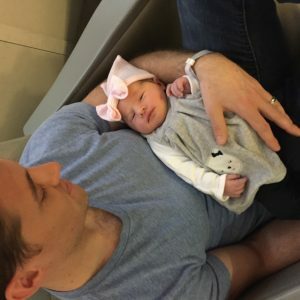 It wasn’t the primal feeling like I expected, but mentally I was “done” with contractions and wanted to do something about them, so I was willing to try pushing. Dr. Byrd put in a catheter to drain my bladder (weirdest sensation ever). I think I started pushing around 8-8:30pm. I remember feeling excited when they brought in the mirror. Y’all. I pushed for THREE HOURS. I tried different positions like hands and knees, holding the bar while squatting, but I was so exhausted from walking and the long prodromal stage of labor that I couldn’t get a good push AND stay in position. I ended up on my back with my legs in the air despite painful back labor and a previously broken tailbone (see above). Jason held my right leg. My mom held my left. Paige held pillows behind me and used a washcloth on my face. The nurse and Dr. Byrd coached pushing with each contraction. I could see my girl’s head in the mirror with each push, but she didn’t wanna come out! The monitor around my belly showed the baby’s heart rate was holding steady at 155 the entire time. Not in any distress, which was a good sign. At 11pm a new nurse came in to relieve the other one for shift change, and I looked at the clock. When I realized it had been over 3 hours, I turned to Dr. Byrd and said “I need some help.” She looked at the nurse and got out the vacuum extraction at 11:30pm. I pushed once and the cup popped off. Everyone in the room gasped. I pushed again, and she was born at 11:37pm Sunday night after nearly 36 hours. Claire came out sunny-side up and crying, so they let Jason cut her cord and then took her to NICU team stationed in the room for checks, cleanup, and monitoring. She was perfectly fine (and looking back, while I’m glad for the NICU team, I don’t think they needed to be there). She was 8 lbs 3 oz, 21″ long, with a 13″ head circumference! I had some second degree tearing so I had to wait to do skin-to-skin while they stitched me up. Claire was exhausted from such a long and active labor, and was very sleepy. Once they swaddled her and gave her to me, she didn’t cry. She was alert for a bit, so I tried to nurse her, but she wasn’t interested in latching and fell back asleep. I asked for lactation help on the way to recovery. My mom and sister went back to my house to get some rest. You’ve been with me long enough. Thanks for reading! Here are some of the most memorable pictures of the moment we became parents. I love birth stories. We chose to do a lot of things differently when we had our second in 2017 and delivered her at a birth center. 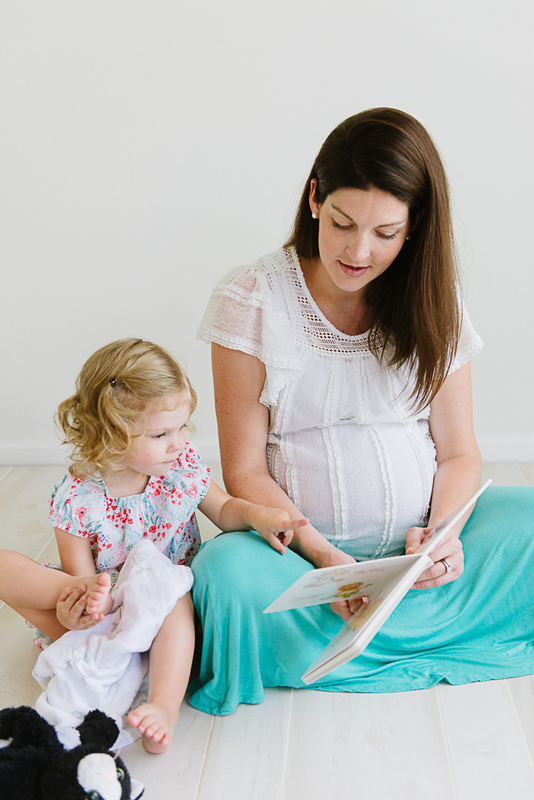 I used my experiences with Claire’s labor and delivery, along with evidence-based practices, to help me modify my birth plan going forward. I am still pretty happy with how things turned out. And, ultimately, my girl arrived safe and sound, so I have nothing negative to say! I’d love to hear from you! 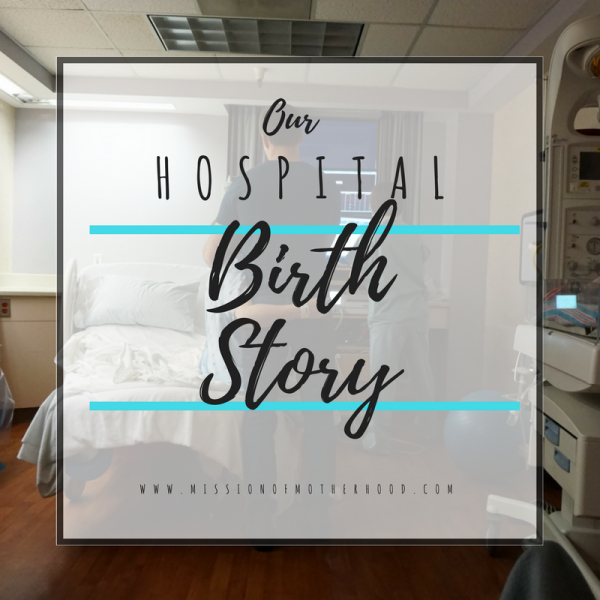 What was your hospital birth experience like? Leave a comment below! 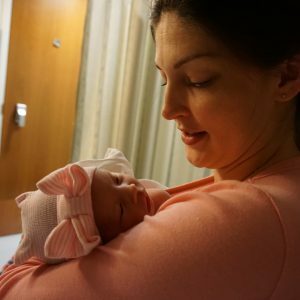 I also love birth stories! 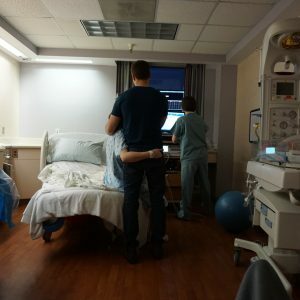 Ours sound similar in a lot of ways–LONG labor (about 48 hours but I’m not sure when it started exactly because I had back labor the whole time), long time pushing (also 3 hours), running out of warm water in the tub, lots of hot showers, finally delivering on my back with Casey and my doula holding my legs up! LOVE it, whew GO YOU! I love that you had a doula! What would you do differently, now that you’ve experienced it? 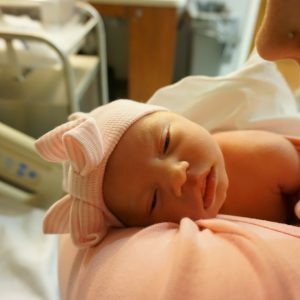 Will you use this (or another) doula again in a hospital setting?? You know, I’ve gone back and forth as to whether I would have gone to the hospital earlier if I were to do it again. I labored for about 43 hours at home and only went in to the hospital about 5 hours before Mira was born, when I was already dilated to 9 cm. On the one hand, maybe I could have gotten something to help me sleep (pain meds or otherwise) and so I would have been less exhausted by the end. (Starting motherhood on 2 days without sleep was no picnic.) On the other hand, my labor was long and maybe the docs at the hospital would have been impatient and urged me to get interventions that I didn’t want. And didn’t need–my body was just doing things on its own time, and everything was fine! As for a doula, yes I would absolutely choose to have one again! She took care of me AND Casey when we were exhausted and out of ideas. And though we weren’t at the hospital that long , I knew she would be a strong advocate for me and my birth preferences if it ever became necessary.